As Dow Chemical evolves as a company, its head of public affairs and government affairs embraces challenges in order to enhance the brand's global footprint. When Matt Davis, corporate VP of global public affairs and government affairs at The Dow Chemical Co., meets with a fresh group of interns, he knows how they are feeling - literally. More than 25 years ago, Davis - then a student at Michigan State and a government and politics junkie - was himself an intern in Dow's government affairs function. Many roles at the company and trips around the world later, he is leading government and public affairs for the world's second-largest chemical maker in terms of sales. A lot has changed since the mid-1980s. As an intern, Davis worked on Dow's internal TV program as a reporter, chasing stories inside the company for an audience of employees. To keep staffers up to date on what was happening around the multinational corporation, the company used the Dow Today internal newsletter, which was delivered office to office on a mail cart to eager staffers. Like virtually any other large company, Dow has moved on to Internet-based methods to keep workers abreast of what is happening around the business. What has not changed is the complex job of explaining what exactly Dow does and how it improves consumers' lives, even though it is a b-to-b company, which operates in 160 countries. That challenge - one of Davis' most pressing - has actually gotten easier, he explains. The Dow Chemical Co. Various roles. "When I joined, we were more of a commodity company, so when my relatives at holiday tables would say, 'What do you do?' it was more difficult than today," he says. "Our employees can now go home and say, 'See that iPhone or iPad that you have or that flatscreen you are sitting in front of? Those are Dow materials.' There's virtually nothing you touch every day that does not have Dow materials." Even as Dow continues to evolve as a company - late last year, the Michigan-based business said it would exit some chemical sectors with low margins - the company is trying to streamline ways to explain itself to high-ranking government and business stakeholders, as well as consumers. Davis calls it "leading with the Dow diamond," referring to the red and white logo the organization has used for decades, and that strategy is key to the corporation's ongoing rebranding process. "There's still an image that we are an industrial company, that we're not an advanced manufacturing company, and that people don't know what technologies we are bringing to market, so our rebranding goal was to reshape people's image of the organization," he explains. "People ask us if we are going to change the name of the company - and no, we have no plans to change it - but we are changing our mindset." Davis notes the success of General Electric in changing the common use of its brand to GE and Apple's work when it dropped the word Computer as the company expanded its hold on the world of mobile devices. What Dow is doing is similar, he says. "When we lead with the Dow diamond, not that we are in any way turning our back on our heritage, but we have evolved into much more than a chemical company," Davis adds. "We are bringing all of these sciences to bear for solutions." Another way Dow is trying to change its reputation among consumers is through its worldwide partnership with the Olympic Games, joining the ranks of consumer- facing brands such as McDonald's and Coca-Cola in that coveted role. Davis says Dow's status as an Olympic sponsor is also a pride point for the company's employees. "We have a joke around here that every good ring needs a good diamond," he adds. "I was at the London games, and to see our diamond being displayed with one of the most recognizable signs in the world in the Olympic Games gave me a great sense of pride. I can only imagine how it is for people who are new to the company." However, Davis adds that the Olympic partnership is much more than just a branding opportunity for Dow. It contributes to the company's bottom line by helping the organization become more attractive to potential clients in global markets. "If partnering with the Olympics was only a positive branding opportunity - and it is - we wouldn't have done it," he notes. "There's a great business opportunity to be involved and be a sponsor of the games." Davis, a Michigan native, is based at Dow's headquarters in Midland, MI, and attended the University of Michigan and Michigan State University. So what side does the communications leader take when the two rival colleges square off in the hotly contested Big 10 rivalry? “It's more complicated than it used to be,” says Davis, who adds that his office at Dow is divided between the two schools. The Sochi Olympics were not short on hot topics, from the Russian government's stance on gay rights to threats of terrorism. However, Davis contends that top brands cannot shy away from some controversial situations if they want to grow their footprints. "Every worldwide sponsor will tell you there are always some challenges, but if you back down from those sorts of things, you will never advance your brand," he says. "You don't get to be 117 years old [Dow was incorporated in 1897] without having some challenges or adversaries, but we can't back down from them either. We have to get into these debates respectfully, but continue to focus on our vision." Dow has faced many critics throughout the years for its environmental record, as well as business decisions, such as its 2001 acquisition of Union Carbide, a company responsible for a gas leak that killed thousands of people in India in 1984. Amnesty International, for instance, said Dow has not done enough for survivors of the disaster. Greenpeace filed a lawsuit against Dow, agency partner Ketchum, and other companies in late 2010 saying they used "unlawful means" to obtain confidential information about the environmental group. A US District Court judge dismissed the lawsuit in September 2011, but Greenpeace re-filed in Washington, DC, superior court a month later. A judge dismissed some of Greenpeace's claims last year, though the group is appealing that decision. Davis says the company is engaging a greater range of organizations as part of its outreach, including environmental activist groups. Dow is partnering with nonprofit The Nature Conservancy and has a long-running partnership with Habitat for Humanity. "Most organizations, and I know Dow has evolved throughout the years, have not engaged people to the degree they could have. We're doing that much better today," Davis explains. "You have to, because people will go one on one with you online. And those companies that have resisted are not going to evolve or grow." Dow has placed the challenge of reaching diverse audiences under Davis, who reports to CEO Andrew Liveris. As his title implies, he's responsible for both global public affairs and government affairs - no small feat at a company with stakeholder relationships in regions around the world. Dow defines both areas differently than most companies. The government affairs side of the position includes responsibility for building and maintaining relationships with government leaders around the world, as well as public policy, issues management, and crisis communications. 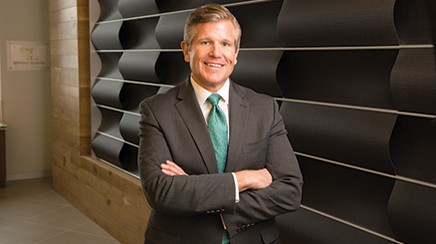 Under public affairs, he oversees branding and advertising, corporate communications, media relations, financial and investor communications, social and digital media, CSR, the Dow Foundation, and other business communications. Davis says government affairs becomes more important each year as, "governments are acting like companies nowadays." He adds that the streamlined structure of having both government and public affairs under the same manager - Dow had split responsibilities for various departments only to bring them back together - allows it to move quickly in the digital media age. "It's a lot faster when you are under one umbrella, decision point, and leadership team and moving in the same direction," he says. "Given the pace of change, if you can't pivot to not only respond, but also direct communications, you're going to be lost." While he has a wide range of responsibilities, Davis, a Michigan native, has worked in a variety of communications positions in his 27 years at Dow. "The reason why I believe I'm uniquely qualified to lead Dow today is because I've sat in every chair in the organization up to this point," he says. "There's not too much that surprises me. Can I call myself an expert in each area? No. But I have people who are experts in media relations and business communications, and I have enough knowledge to understand what they need, what challenges they're going through, and how I can remove barriers for them." Dow chairman and CEO Andrew Liveris also cites Davis' wide range of experience in moving the communications group forward. "As we drive the next phase of Dow's transformation and lead the evolution of our industry, government affairs and public affairs play a critical role," he says. "Matt's in-depth knowledge of our brand, heritage, and positioning in this new world order provide the leadership we need globally to deliver on our strategy and success. His leadership experience around the world in these two areas help strengthen Dow's reputation and market performance." In terms of leadership style, Davis tries to model his on someone who had a profound effect on him: President Ronald Reagan. "I teach courses on leadership presence and use Reagan as an example. He knew he wasn't the smartest guy, but he surround- ed himself with people who were better at some things than him," he says. "I try to know where my gaps are and bring in people who can help me in a leadership setting."